Fifties look dresses and up-dos have always fascinated me. Its a style of fashion that I absolutely adore- and its so fabulous to see on gorgeous plus-size pin-up babes! Although a favorite look, I'm truthfully not very good at pulling it off myself. Soooooo! I was super excited when Trudie from My Vintage Childhood (another local and totally fab Aussie blogger), organised an amazing event to teach us how to do just that! 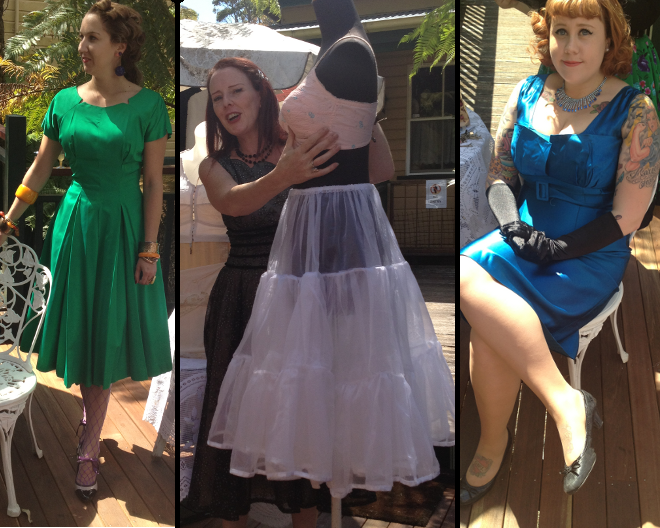 Held at Kitty's Vintage Kitsch and The Shop That Time Forgot, it was a truly amazing day! The atmosphere was very relaxed and fun as Celia taught us all about undergarments, girdles, colour matching and my most favourite lesson of the day- how to spot an authentic 50's, 60's or 70's dress! Celia's friend Elisse was also on hand as our vintage hair and makeup specialist on the day! She talked us through pin-curls, accessorizing make-up trends and even how to do the perfect winged eyeliner! While Sheri was our gorgeous model who let us see all these amazing vintage styles made-up in real life! After the event was over I spent far a gorgeous hour or so pottering around Celia's amazing shop. To say I could get lost in there would be an understatement Such an amazing collection (and all in such perfect condition) of vintage and retro goodies! And what to wear to an event like this! Well like I said, I'm a little retro-retarded, so I thought I'd just jump in and have fun with it! The only thing vintage about this outfit is my pretty brooch! It originally belonged to my Nanna and I have a few similar ones in different colours that she has passed down to me. I love rummaging around in her jewelry collection- I feel like I'm in Casablanca whenever I put some them on! The super cute dress is from ASOS Curve. I love the amazing shape it gives with all the petticoats! Do you wear vintage clothes?? What would you like to learn at a vintage styling event?? Awww sweets thanks for the mention. It was such a wonderful event, so much fun. I love that you have your Anna's brooches. Vintage accessories are such a great way to get started into vintage and mixing it with your modern wardrobe. It's a safe start for those who are testing the waters and then you can get more daring with loathing pieces as you develop more confidence and knowledge. Damn that should say nana's........sorry comment box stuffed up and wouldn't let me fix. I love vintage clothes on others, but haven't tried them myself. Love the floral print on your dress. So many gorgeous girls! And those hats made me swooon (have a thing for hats XD)..
How bright and bubbly you look in that pretty pretty dress. ^^v Adorable. Oh I would love to go to something like this! I would most like to know how to stele my curly hair in a vintage way! And learn how to use curlers and rat rolls! You look amazing! I love the dress, and it looks so cute with the pink tights! You look so pretty and love the hot pink tights it brings so much more to the outfit. Your pics are always adorable.